The committee meets regularly during the year with the majority of the eight or nine meetings in the July to November range. The committee members listed below were elected at the 2018 Annual General Meeting. This page has a full list of committee members since 1988. Many thanks to John Dean for compiling the list. Jay Fleming is in his eighth year as president. 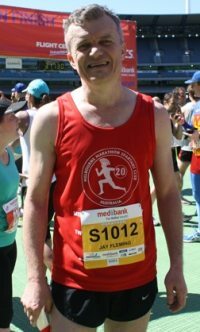 Jay is passionate about running, about the Melbourne Marathon Spartans Club and is a continual source of ideas. He is committed to making membership of the club increasingly desirable and pleasurable. He loves new ideas, so if you have a suggestion, Jay can be contacted at 0418 374 783. 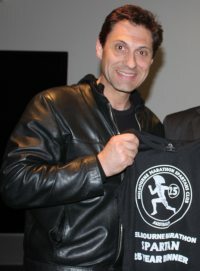 Paul Basile is vice president and a life member. He is a backup to the president when Jay is unavailable. 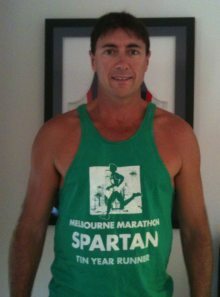 In recent years Paul has organised the Spartans tent at the Melbourne Marathon Expo in the days before the marathon. 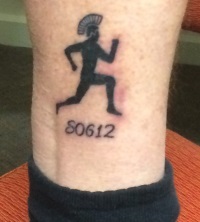 He has also managed the Spartans tent at the finish and is responsible for much of the back room work for the AGM. John is a former vice-president and treasurer. 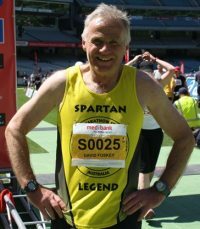 He is also a Life Member and Melbourne Marathon Spartan Legend. He recently rejoined the committee after a year away, and we are glad to hear his wise words again. Responsible for the finances of the club. Has been doing a lot of work recently optimising our stocks of current singlets, and helping sell our older singlets. He was awarded Life Membership at the 2017 AGM. John Dean was president for several years. John is trying, not altogether successfully, to reduce his involvement with day to day activities but has immense experience of the running of club. He can always be relied upon to produce a list of actions needed, from organisation of chairs for the AGM to arranging provision of tent at the marathon finish. He also has a seemingly never ending supply of club memorabilia. 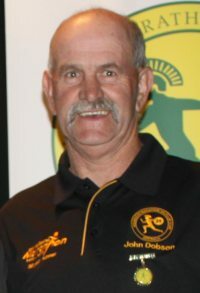 John is a Hall of Fame Spartan in his sixth term on the committee. He brings valuable business experience, and considerable energy, with him. He has recently arranged to centralise the storage of Spartan materials (eg banners) and merchandise at a single location. Felicity Doolan joined the committee early in 2014 and took on the role of secretary after earning her ten year singlet in 2013. 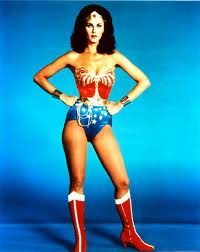 She is unable to attend committee meetings, but does invaluable work administering incoming Spartans and those moving between singlet colours. 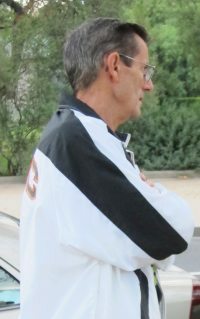 Colin Silcock-Delaney has been a member of the committee for several years. He lives in the country and can’t always attend committee meetings. However, he always ensures that he is available to help at the AGM, and is a constant presence at our Expo tent and managed the tent at the finish from early in the morning to the end of the day. Anne Ziogos joined the committee in 2017. She shares secretarial tasks with Felicity Doolan. 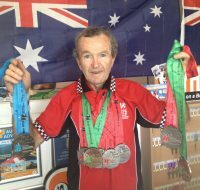 Anne has completed 21 Melbournes as well as many of the most challenging runs worldwide, most recently the “Grand to Grand”, a 280km self-supporting stage race in the Grand Canyon. David is the webmaster: contact him. He loves to post new articles of interest, so send in your story. Matt Callaghan is new to the committee, elected in 2018. He brings business expertise, and is currently investigating some new apparel options. 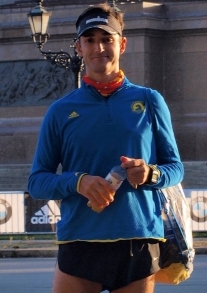 His photo shows him at the Berlin Marathon and he has other overseas experience including Comrades. 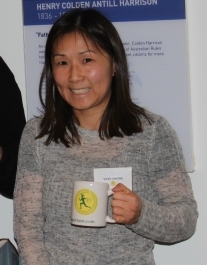 In May 2018 Vicky Chung approached the Spartan Committee and offered her assistance. 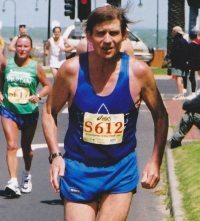 Whilst having only completed eight Melbourne Marathons at that time her offer of assistance was accepted. 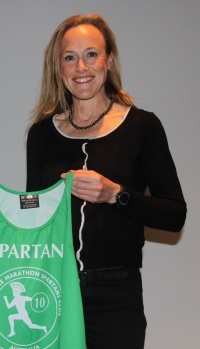 Vicky’s past committee experience was as a Committee and Board Member of Dragon Boat Victoria and on joining the Spartan Committee she is keen to pursue the availability of Local and Government Grants to the Melbourne marathon Spartans Club. Vicky was formally Seconded to the Committee in June 2018. She looks forward to being presented with her 10-Year Spartan singlet in 2019. Please contact us if you’d like to be involved with administration of the club. You don’t have to have supernatural powers to be eligible. Which committee member has recently shown his dedication in a permanent way?